We make cylinder sleeves for all performance engine applications. 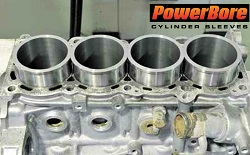 PowerBore Cylinder Sleeves is a division of Quaker City Castings, located in Salem, Ohio. Our sleeves are manufactured for a wide array of applications, including standard automotive, truck, tractor, and performance engine and racing applications. We can customize most sleeves based upon specific customer needs. Looking for something custom, or a size that isn’t in stock? We can help! Email us your dimensions using these blueprints as a guide, and our sales team will get back to you with a quote and delivery lead time. We pride ourselves on fast turnarounds, without compromising on quality – our use of high-performance ductile iron allows us to produce the finest-quality cylinder sleeves available, tailored to any application. WHAT IS A CYLINDER SLEEVE? A cylinder sleeve (also called cylinder liners or engine sleeves) is a cylindrical metal engine component that protects an engine’s bore and can be used to create bore dimensions after an engine has been over-bored or modified. Cylinder sleeves also assist in transferring heat from the piston to the coolant (if you are running a wet sleeve). The standard material for a stock cylinder sleeve is Class 30 gray iron (ASTM A48). Class 30 gray iron is a highly versatile material with good hardness characteristics, but it lacks toughness and tensile strength. Ductile iron is the preferred material for high-performance engine sleeve applications due to its improved tensile strength, yield strength, and elongation. We here at PowerBore produce high-performance cylinder sleeves to the 100-70-03 ductile iron specifications (ASTM A536). This material is made to withstand your highest horsepower and cylinder pressure applications. We also have our own proprietary Power Ductile material, which exceeds even the material properties of 100-70-03 ductile iron. Whatever your application and whatever your engine type, we can produce a custom cylinder sleeve that will put you in a position to get the best possible performance out of your engine.